At this time of year, the path running through the meadow is overrun by plants, including stinging nettle (Urtica dioica), which was in fruit. The sunny-yellow flowers of tansy (Tanacetum vulgare) were a welcome sight. Native to Eurasia, the plant has fern-like foliage topped by round flowerheads consisting of numerous tiny flowers. I found a few white-margined burrower bugs (Sehirus cinctus) hiding in the tansy flowers. They are also known as mother bugs because they are one of the few insects that care for their young, bringing them seeds to feed on for a few days after birth. More photos here. Goldenrod (Solidago sp.) was in flower. From a distance, these plants look like the tips of the plant have turned a bright yellow. The goldenrod blossoms were covered in beewolves (Philanthus gibbosus). While the ones I saw were foraging for nectar, these wasps sometimes visit flowers to hunt for bees. They paralyze the bees and carry them to their nest in the ground to feed their beewolf larva. Thanks to John Ascher for the ID. Close by, a possible victim foraged in a jewelweed flower (Impatiens capensis). The flower’s structure forces the bee to emerge covered in pollen. Common burdock (Arctium minus), whose flower buds could be mistaken for those of a thistle, was also in bloom. Ever-invasive purple loosestrife (Lythrum salicaria) reared its flower-heads here and there. Most of the plants looked healthy, but I found a few plants whose leaves had been thoroughly chewed through. I know that biocontrol beetles had been released in the Neponset River Watershed, and so wondered if those beetles had made their way here. Sure enough, I found a small brown beetle with beady black eyes, a purple loosestrife beetle (Neogalerucella pusilla). This guy and his kin were doing their job keeping the plant in check. I mistook a nearby plant for purple loosestrife, but its flowers were of a purple with a greater share of blue. It turned out to be swamp verbana or blue vervain (Verbena hastata). As one would expect, these plants like wetlands. I found a brown-lipped snail on a cup plant (Silphium perfoliatum). I picked it up and it retracted into its shell, but it wasn’t long until it re-emerged to check me out. Wild carrot or Queen Anne’s lace (Daucus carota) lay just outside the meadow area. The floweheads have many small white flowers and, usually, a purple one right in the center. The purple one in the photo below is so dark that it looks like a piece of dirt. Microscopy UK has some excellent photos and information on this plant. Japanese beetles were all over a porcelain berry vine (Ampelopsis brevipedunculata). As you can see in the photo below, some of the leaves looked like nets. These beetles took time off from devouring the plant to propagate their species. I had seen this leafhopper nymph (Coelidia olitoria) earlier in the year. This individual still has green eyes but it is not as yellow and brown markings can be seen on its curved abdomen. I found a katydid nymph (Microcentrum sp.) on a leaf. Note how long its antennae are, much longer than its body. It also has a yellow strip running down its back, that appears to split in two midway. Thanks to metrioptera for the ID. I flushed this garden tortrix moth (Clepsis peritana) out of the grass. Finally, I saw this wolf spider (Pardosa sp.) which jumped from leaf to leaf as I approached. Wolf spiders carry their egg sacs behind them, which is what this one appears to be doing. As always, the Arboretum is full of interesting creatures! 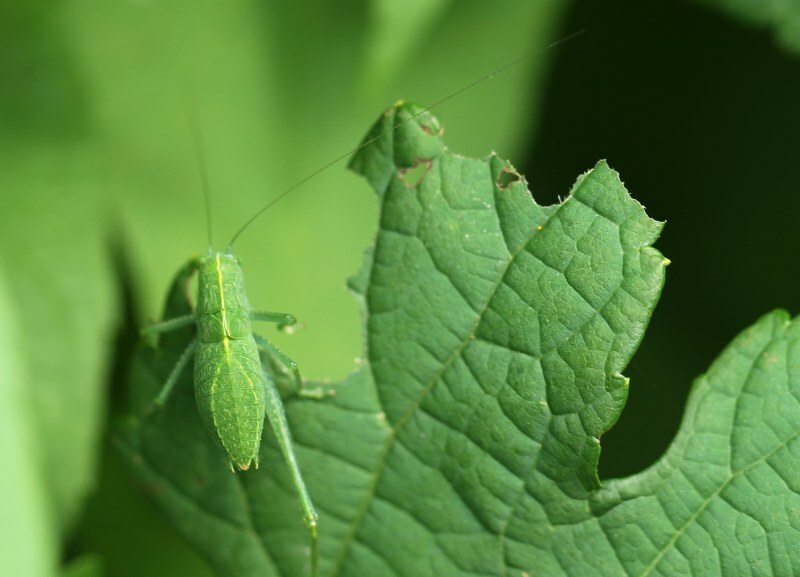 This entry was posted in Nature and tagged Ampelopsis brevipedunculata, Arctium minus, Arnold Arboretum, asters, beetles, Boston, bugs, carrot family, Daucus carota, garden tortrix moth, goldenrods, grape family, impatiens capensis, insects, katydids, leafhoppers, Lythrum salicaria, Massachusetts, mollusks, moths, nettles, plants, Silphium perfoliatum, snails, spiders, Tanacetum vulgare, urtica dioica, Verbena hastata, verbenas, wasps. Bookmark the permalink.